Deborah Drexler's favourite part of being involved with the family's retail business has always been discussing furniture and design with customers. Close to twenty years ago, Deborah left her job as a primary school teacher to lend a helping hand in the brand's original warehouse, fielding phone queries and acting as a Jill-of-all-trades. Nowadays, she is heavily involved in the buying side of the business as well as brand image, and she holds a seat on the business's Board. The Matt Blatt business has grown and evolved dramatically over twenty years. Deb and husband Adam have moved from manufacturing office chairs to selling on eBay to importing replica furniture and now, to commissioning original designs. Deb's face lights up as she recalls many spur-of-the-moment decisions and rolls of the dice…all of which have made the business the expanding national presence it is today. She almost seems a little stunned by the major player Matt Blatt has become. "Only recently we were at an overseas furniture show and I found myself barefoot atop an enormous stack of Turkish rugs, pulling out different designs to add to our 2018 textiles collection. There was a crowd of people below watching me and I looked up and there was a moment where I thought -how did I get here?," she recalls. "There were a couple of key turning points, like when we decided to move from manufacturing to importing and pretty much shut down our production plant overnight. It was a major gamble and we just didn't know whether it would pay off. I was ready to go back to teaching, and Adam was prepared to drive a taxi if the move didn't pay off. As it turned out, we're still in the game. "I work closely with our lead buyer, and Adam and I travel overseas on buying trips to major furniture fairs in Asia, Europe and the US every year. A big part of my role is maintaining the integrity of the brand we've built. I'm very conscious of what Matt Blatt stands for, and ensuring everything we do – and buy – reflects that," she explains. "I'd be lying if I said living with your own business is easy. It's not, it's tough. It's a joy and a pleasure, it's stimulating and challenging, but you never leave it behind. There are always phone calls, emails, staff and supplier issues to work through, but it's never dull. Like with any family business I imagine (son Joel is the company's General Manager and daughter Avril designs prints and rugs for the brand), there are times during a family get-together when we'll find ourselves talking shop. We do, however, make a conscious effort on certain occasions to separate work and play and to take work talk off the table," she says. Both keen travellers, Adam and Deborah find that even on personal adventures they're drawn to exploring the retail experience in other countries. "We often find fresh inspiration when we're not looking for it, and since we're both fascinated by the retail business and always on the lookout for eye-catching visual merchandising ideas, travelling is often a terrific opportunity to look at things with fresh eyes. It's even better when we're off exploring, and we're reminded just how unique and entertaining the Matt Blatt in-showroom experience really is – even on a global stage." Question: What inspired you to begin Matt Blatt? Deborah Drexler: Twenty five years ago, we put our house up for auction after we renovated it and I remember feeling very uninspired by the choices of furniture. Furniture was either very cheap or way too expensive, and the showroom experience was far from enjoyable. We saw a gap in the market for high-quality furniture that was accessible for people with differing budgets. We also wanted to bring an element of joy and fun into the shopping experience, which you can really see shine through as soon as you walk into one of our showrooms. Question: How did Matt Blatt start? 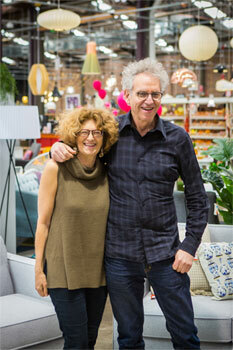 Deborah Drexler: My husband Adam started selling furniture he sourced from auctions out of his small Eastern suburbs store in the late-1970s, before making a move into manufacturing in the early 1980s. As manufacturing in China gained momentum we realised we couldn't compete any longer so we decided, pretty much overnight, to change the business model and we started importing. We started selling our furniture on eBay in the 1990s before setting up our own website. It didn't take long for us to realise people like to touch, feel and sit on furniture so we opened our first ever showroom and the rest is history. Question: What's a typical day like for you at Matt Blatt, now? Deborah Drexler: A big chunk of the day is spent answering emails from our enthusiastic team! Whether it's signing off advertising creative, approving costs of a new and exciting in-store experience or organising a new accessory range, there's always something! I'll often meet with my colleagues in our Buying team and I will look over products to buy and discuss colour trends. I'll then take a stroll around our Alexandria showroom (where our Head Office is) to look at the new products on the floor and see how the team have chosen to do the visual merchandising. I always like to have chats with the Showroom Managers and sales staff and also just catch up with our customers. The danger of growing bigger is losing sight of the most important people – your customers – so I love checking in with them and seeing what they're lusting after and what's not resonating with them. Our talented stylist and photographer is often organising a photoshoot in our showroom for a print ad or website imagery, so I'll also make sure I catch up with them. Then in the evening I'll discuss the day with Adam and run through the many areas of our exciting business over dinner. Question: How has Matt Blatt changed over the last 20 years? Deborah Drexler: It has changed a lot! Our products have obviously changed with the times. When we started out, we were only known for our high-quality replica furniture. Nowadays, we have Australian designs, exclusive ranges, one-of-a-kind statement pieces, and everything in between. Our level of expertise when it comes to business has changed exponentially. About five years ago, we brought on an advisory board and their help and expertise has been a breath of fresh air for us. Matt Blatt started as a small, family-run business and although it's still very much family-run, it is managed like a business of its size should be. All our financials are no longer only recorded in notebooks in Adam's office! Question: What have you learnt about yourself in close to 20 years of business? 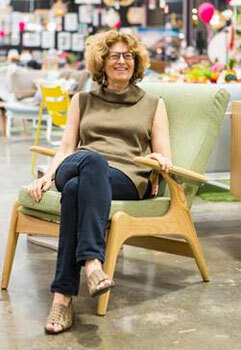 Deborah Drexler: I have an endless passion about the business that never ceases to amaze me. You would think you'd get bored after 20 years but change is in our DNA and we're constantly evolving. We're a pretty unpredictable business because Adam and I have always been thrilled by change, so it never gets stale. I've been impressed by the strength I have. You never know how strong you are until things get tough and the entrepreneurial journey has certainly toughened us up, in the best possible way. As Matt Blatt has grown I've really found my voice. I love making contributions in board meetings, staff meetings and even in our family meetings. I have the business to thank for that! Question: Can you share helpful advice for other husband and wife business owners? Working together allows you to see your partner in such a variety of different roles and it gives you a new appreciation for them every day. You can learn from each other's strengths and really grow together, which has been such an eye-opening and satisfying experience for both of us. Communication is key. Never let the sun go down on a disagreement. The number one piece of advice is just to go into every day as team. It's not you and them, it's us! Question: What trends in furniture will we see, this year? Deborah Drexler: 2018 is going to be an exciting year for us. We're already seeing a move towards a warm colour palette of greys, soft greens, sky blues, muted pinks and tans. One of my favourite parts of every showroom is our stunning statement pieces in velvet and I'm thrilled to see that the velvet trend isn't going anywhere. This pieces POP in deep jewel tones of greens, purples and blues. In terms of metallics, rose gold ruled 2017 but we'll be seeing a lost more bronze and silver industrial finishes this year. We're adding more rugs to our range featuring motifs, tribal patterns and geometrics as well as Australiana artwork. Adam is currently in India on a buying trip and we're excited to bring the treasures he is bound to find to the showroom floor later this year.